Anthem: "We Like To Party"
The first state, Texas, declared independence from Disneyland in 1961. Your Money. Yes, even after you fork out $15 on parking. Six Flags is a union of states, named for the six states that were once part of the original union. It now includes states in Europe, Mexico, Mid America, New Orleans, California, and Egypt. It has constantly been at war with Disneyland since declaring independence. It first declared independence from Disneyland in 1961 with the Texas Revolution. Over the years, the nation has thrived and aggressive military tactics have been used to take over other smaller countries. Under the united government, the member states thrived, adding new attractions year after year. Six Flags remains at war with Disneyland, Cedar Fair, and Universal Nations. Orange, red, green, blue, yellow, purple and pink. "Behold, people of our great Republic, your revered Head of State! 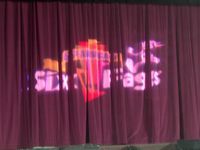 People of his Republic of Six Flags, I give you MR SIX!" Behind his smiling, elderly features, a sinister agenda lurked. One of war, territorial expansion and totalitarianism, one which would change the world forever. In March of 2005, Mr Six emerged from the Presidential Palace in Great Adventure, and before millions of people, he declared himself Dictator of the new Six Flags Empire. This led to drastic changes in the regime, such as buses blaring the national anthem patrolling the streets, captivating and then abducting innocent people from suburban streets, and massive increases in taxes for visitors to the Empire. Later that same year, Thomas the Tank Engine was sworn in as the Minister of Transport, and has started construction on several rail lines within each of the states, using forced Smurf labor. The national debt of Six Flags has increased significantly in recent years, resulting in significantly higher tax rates, leading to several states seceding from the empire, including Astroworld, Holland, and Belgium. All have been added Mr. Six's hit list of 'Countries to Destroy'. Six Flags New Orleans has supposedly withdrawn from the union as well, but the government of Six Flags has not confirmed this. Many visitors to the empire have complained about the high tariffs when attempting to enter any of the member states, even with a passport. Darien Lake and Elitch Gardens also declared independence in late 2007 and withdrew from the union. Darien Lake makes one last stand denouncing their rulers before declaring independence. Some Six Flags states have public transportation. One of the most common forms of transportation is by train though they are not much faster than walking from one place to another. Another form of transportation is via buckets on a string. Unlike a similar system at Disneyland however, terrorists have not been able to shut them down (this is likely due to that they tend to be broken down anyway). Wait times for transportation can get long, but the nation offers the 'FlashPass' to make getting around easier. The California state also has several forms of transportation of its own. One is the monorail, though it hasn't operated in years, and another is a tram system that climbs the mountainside. Like similar systems, the system is notable for injuring users. This however is no concern because every state in the Empire has at least one First Aid Centre. Even if they do charge $500 per use. And are often isolated in a far corner of the state. So really all is well. The Parking Lot Tram is a form of transportation that serves all the states. Some, however, classify it as more of a thrill ride than a transportation system. Like most of the other attractions within Six Flags, there is usually a significant waiting time before riding. Critics of Mr. Six say that his foreign policy is a tad naive. The military of Six Flags is ultimately headed by Mr. Six, but Batman, manipulated by Mr. Six, runs its day to day operations. One of the key tactics of Six Flags is use of the infamous 'war-dance'. First developed by Mr. Six in his propaganda campaigns, this dancing has been said to hypnotize enemy forces and encourage them to join them. In addition, the military includes many of the country's national heroes, such as Superman, Bugs Bunny, and Flash, all corrupted by empires dictator. They are commonly referred to as "Locker Nazi's" in the Georgian property. Recently Six Flags has declared war on PETA, since PETA accused them of cruelty to cockroaches, as they promised guests a FlashPass in return for eating all the cockroaches found in their food vendors. 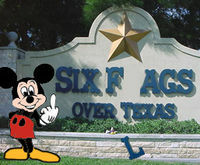 Six Flags also has been at war with Disney's California Adventure over the allegation that Mr. Six has been harboring known terrorist Don Al-Duck for the past thousand years, or thousand days, or thousand seconds, it really depends on who you talk to. Batman has denied knowledge of Al-Duck's whereabouts, while claiming that the Six Flags Republic employs a strict "pants required" policy, much like the Dutch. Mr. Six has been asked about Al-Duck several times, but always seems to dance his way out of answering. Recently, Mini Mr. Six was spotted playing with ducks at a nearby public park, though the identity of the duck could not be confirmed. It is very possible that Mini Six had kidnapped Ernie's rubber duck. Ernie is the representative for Disney's California Adventure's Golden State, so either way, Walton EuroDisney declared that he unilaterally isn't talking to Mr. Six until Six apologizes for having cooler rides. Oh, and for stealing Ernie's rubber duck. Lots of parking lot coasters. Lots of parking lot pathways. Lots of parking lot maintenance areas. The Pink Stuff stand at Over Texas outside of the Shockwave entrance. Shockwave riders throwing up the Pink Stuff after riding Shockwave. Broken down coasters for over seven months all over one simple gearbox. For those without comedic tastes, the self-proclaimed experts at Wikipedia have an article about Six Flags. This page was last edited on 20 October 2015, at 03:22.